First of all I'd like to say how informative your website is. My first question is that can all German Shepherds that come from Animal Shelters be trained to eventually be able to act like a 'normal' dog and I don't mean to sound rude or anything when I say 'normal' its just that I would like to be able to try to teach a dog to become less shy around humans and to maybe one day protect me when an intruder comes into my home. Secondly if a person was to be at work all day but spend the rest of their time with there dogs would this be enough time for the dogs needs? or you would you have to have someone home most of the time during the day? Hi Matthew, thanks so much for the nice compliment - now on to answer your questions: yes, it is possible to train a shelter dog to behave "normally" but that does require time, patience and training and lots of love. And it will also depend on the dog since some may have more "baggage" than others due to their history, possible traumas, etc. But if you do actively work with the shelter/rescue operators they can often offer you information on what to do to help the dog acclimate to its new home with you faster. Plus, just spend time with the dog and develop a bond with it and you will have a forever friend really fast. a dog home alone all day is not a great situation but it is one that many dog owners must face. The best case scenario would be for someone to be home with the dog most of the day - but this is often not possible. But if not possible, maybe if someone can come by a few times while you're at work to walk the dog and check on it, that wouldn't be quite so bad. And it's so nice that you are thinking about this before just acting on impulse. But if you're thinking about getting a new dog you certainly don't want to get a dog and then immediately leave it at home all day a few days after you get it. This is something you'll need to work the dog up to. After all, if you're thinking of getting a shelter dog, or any dog or puppy for that matter, you'll need to train it to be responsible in your home and with your possessions while you're not there and to be secure, stable and happy even if you're gone - otherwise, if you don't, you may come home to a house full of completely destroyed things - not what you want. So, if you are thinking of getting a dog, really think about the dogs needs first and if you come to realize that owning one now isn't for you then you can always get your "doggie fix" in by possibly volunteering at a shelter or dog rescue near you. Good luck! How should i know if a german dog got pure breed? I am having problems with my 10 wk old shep pup. Peeing and pooping inside, and on the deck!!! HELP any advice? Matthew------------LISTEN TO TOTAL-GERMAN-SHEPHERD.com-----Matthew, take head to their statement,"So, if you are thinking of getting a dog, really think about the dogs needs first and if you come to realize that owning one now isn't for you then you can always get your "doggie fix" in by possibly volunteering at a shelter or dog rescue near you. Good luck!" Matthew, it has never been said better. Now, in saying that here is some facts that I have encountered. I, me and my wife have rescued 6 German Shepherd Dogs including a K-9 European breed plus 2 Labs. This doesn't include a few strays + a couple of cats. #1. All of my rescues have taken between 1 and 2 years before they got over their past and trusted us. #2. If you do get a big dog just remember this: You haven't been bitten untill you have been bitten by a big dog!!!!!!!!! #3. I have had my finger bitten off and my wife has been hospitalized twice mainly because we put our hands trying to break up dog fights. I'll do it again because I love my dogs but people with common sence will tell you-DON"T PUT YOUR HANDS IN A DOG FIGHT!!!!!!!!!!!!!!!!!!!!!!!!!!! #4. They come with baggage but they can learn to love you and they will but it takes 1 to 2 years by my experience. #5. They will protect their territory which will include you and your family. #5. I never held it against my GSD's when we first got them if they were aggressive. I had to teach them to change. Spare the ROD! Love will create change. #6. Respect! You must respect your dogs past and you must become the ALPHA DOG so he/she learns to RESPECT you! Keep in mind, in most cases they were abused. Combine RESPECT and love and your German Shepherd Rescue will become the best friend you will ever have!!!!!! FINAllY--Please, never hit your dog to get it to respect you. 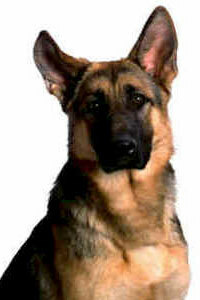 You want your German Shepherd Dog to Respect you out of love and not out of fear.